Nowadays, speaker systems are being produced not only to deliver quality acoustics but also maintain a scrupulous design to enhance the decor of the contemporary homes. Designed to produce most stable and wide acoustic sweet spot, the Audiophile’s Lacrima Speakers feature a four-way design to let you enjoy quality design, while enhancing the decor of your living area. Presenting rounded, teardrop shape, the hand-built speakers not only produces broad, horizontal sound dispersion throughout the room but also reduce the distortion caused by the secondary reflections within rectangular cabinets. Diminishing unnecessary sound coloration and resonance with three tapered tubes, spreading from the drivers to the back of the cabinet channel, the artistic speakers float two bass drivers on silicone O-rings to eradicate mechanical coloration produces crystal clear sound, which is soothing to the ears. 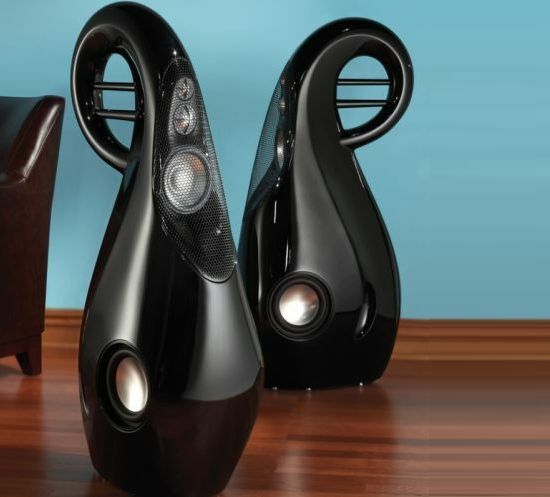 Featuring the body finished in quasi-isotropic glass, reinforced plastic and a lightweight balsa core, the Lacrima Speakers are hand-polished after two layers of high-body primer, three layers of pigment, four layers of clear lacquer and two coats that not only ensure high quality sound but also offer glossy looks for contemporary spaces. Measuring 45 3/4″ x 13 1/2″ x 22 3/4″ (HWD) in dimensions, the inventive speakers presents a unique blend of art and acoustic.